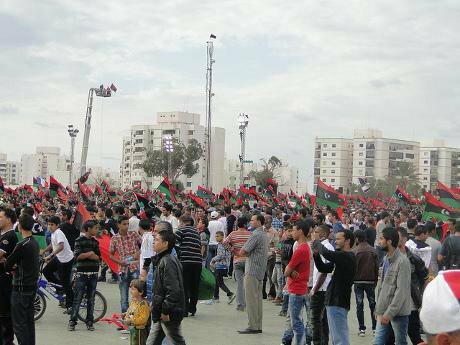 Those were the days: celebrating the liberation of Benghazi from the Qaddafi dictatorship in October 2011. Flickr / Magherabia. Some rights reserved. Since the fall of Muammar Qaddafi’s regime in 2011, Libya has been plunged into civil war. No one really knows where it will lead but it is indefinitely postponing a political transition essential for the country's stability. For some time the African Union (AU), Egypt and Algeria seemed to be key actors in the search for peace but their efforts, under the patronage of the United Nations (UN), have led only to impasse. Enter Morocco, which has in recent weeks organised several intra-Libyan round tables under UN sponsorship. During one such event in April, in the coastal town of Skhirate (near Rabat), the UN special envoy, Bernardino Leon, warned that “the talks would be the last chance to end the conflict” and that “the patience of Libyans and the international community” was exhausted. And there have even been media suggestions that some western officials see such talks in Morocco as the only hope of forming a unity government and halting the fighting. To thoroughly understand what drives Morocco in the search for peace, a regional, even continental, approach is required. Yet in the many analyses of the crisis in Libya and the wider Sahel, the Community of Sahel-Saharan States (CEN-SAD), which has 28 members (two-thirds French speaking) and is a key geopolitical bloc, has been neglected if not overlooked. Qaddafi, the mastermind behind the foundation of CEN-SAD in 1998, had a strategic ambition thereby to reduce French influence on African countries, while counterbalancing the AU, and poured petro-dollars into this regional grouping. Since his overthrow in 2011, however, CEN-SAD has been deprived of much of its financing, removing any impediments for France to reactivate its policy in the Sahel—as witnessed since the advent of the crisis in Mali. For Rabat, controlling CEN-SAD or, at least, being perceived as a proximate supporter of Libya could be highly beneficial. Such a strategy would provide this close and historical French ally with an elevated leading role alongside France, which already has a substantial number of troops in the region, and an even greater opportunity to influence the Sahel. In June 2012, a meeting of CEN-SAD foreign ministers took place in Morocco, officially to find a lasting peace in Mali. In reality, this was a unique occasion for Rabat to showcase its new-found interest in Sahel stability. The fall of Qaddafi and the changing regional political landscape have provided Morocco with the opportunity to influence the Sahel states in its own long-term continental interests. Moroccan diplomats have been extremely active in the Sahel and the Maghreb, trying to reap the benefits of the continuing geopolitical and strategic reshuffling. By giving a lead—directly or indirectly—to CEN-SAD, Morocco aims to strengthen its international position, in Africa in particular, which would facilitate the kingdom’s eventual return to the AU. The union currently recognises as a member the Sahrawi Arab Democratic Republic, which contests Rabat’s illegal colonisation of the Western Sahara territory since 1975, and so Morocco remains outside. Like Egypt (and the AU), Algeria is convinced that only a political solution will eventually put an end to the stalemate in Libya and privileges political dialogue. Aided by regular diplomatic meetings, these two north African giants converge behind mutual efforts to find a lasting, peaceful solution and combat the growing threat from terrorism in the region. The recent peace accords in Mali, signed in Bamako, emerged under the patronage of Algiers. Yet, despite hosting various meetings with the different Libyan protagonists, it has not enjoyed the same success in that arena. It’s not just the complexity of the Libyan equation but what the Algerian daily El Watan characterises as a ‘two-headed diplomacy’. Exerting more pressure on Libyans and putting before them a fait accompli is surely not the best option to find a lasting peace. Oddly, Algeria has both a Ministry of Foreign Affairs and International Cooperation (MFAIC), headed since September 2013 by Ramtane Lamamra, and a Ministry for Maghreb and African Affairs and the Arab League (MMAAAL), led by Abdelkader Messahel. Both are highly respected and experienced diplomats, with a massive knowledge of African affairs. Lamamra (dubbed ‘Mister Africa’), a former AU peace and security commissioner, is the chief author of the reinvigoration of Algeria’s foreign policy, internationally and on the African continent—for too long neglected. He is also behind the flow of African and western diplomats, presidents and ministers to Algiers in the past 18 months. Officially, this dual diplomacy is due to the numerous international files in which Algeria is implicated, in Africa and beyond. But this bicephalous approach is vulnerable to personal rivalries and competitive ambitions. And, if the former US secretary of state Henry Kissinger once famously asked ‘who do I call if I want to call Europe?’, foreign chancelleries might soon ask ‘what foreign ministry shall we call in Algeria?’. To add to this jumble of conferences and round tables, Ethiopia has recently called for a gathering of African foreign ministers on Libya, probably during the AU summit to be held next month in Johannesburg. But given the scale of the challenge, it is hard to envisage any strategy arising from this meeting, as against a loud diplomatic cacophony. And this multiplication of initiatives may only complicate an already complex Libyan and regional geopolitical situation. Worse still, Leon’s exasperated declaration last month may not only indicate that the UN is losing ground. Exerting more pressure on Libyans and putting before them a fait accompli is surely not the best option to find a lasting peace. And while all actors must help Libyans find an overdue political solution, the AU and its member states, supported by the UN, should be the prime driving force. It is thus paradoxical and puzzling that the UN could perceive Morocco, though not a member of the AU, as a viable broker for Libya. If Rabat could harvest any laurels from the thorny Libyan political stalemate, it would open a regional Pandora’s box—with dramatic consequences for the Western Sahara conflict. And if the UN has a viable strategy for stability and security in Libya and the Sahel-Maghreb as a whole, it is not at all evident what it is.